Steenkamp cousin: 'Not a fair sentence' Jump to media player As Oscar Pistorius is released under house arrest, Reeva Steenkamp's cousin Kim Martin speaks to the BBC's Nomsa Maseko. Pistorius approved for house arrest Jump to media player Jailed athlete Oscar Pistorius is to be freed from prison to house arrest next Tuesday, a South African parole board decides. Steenkamp: 'Justice must take its course' Jump to media player Barry Steenkamp, father of Reeva, has given his reaction to the news that Oscar Pistorius had been denied early release from prison. Pistorius may still face murder charge Jump to media player A South African judge rules that prosecutors can seek a murder conviction against Paralympian athlete Oscar Pistorius at appeal. The family of Reeva Steenkamp have said they were "not shocked" when they heard that her killer, Oscar Pistorius, was to be released from prison early, under house arrest. The South African athlete has spent nearly one year in jail after shooting Reeva through a locked bathroom door. He is expected to spend the remainder of a five-year prison sentence at his uncle's home in Pretoria. 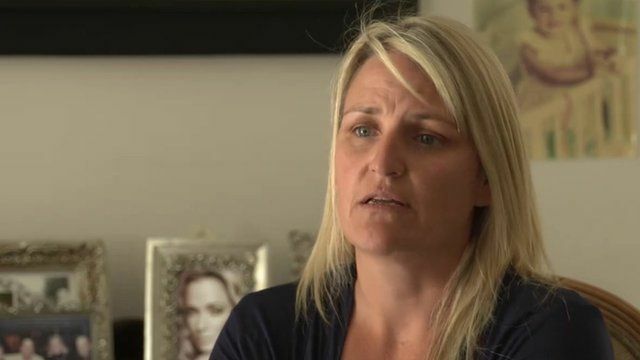 Kim Martin, Reeva Steenkamp's cousin, told the BBC's Nomsa Maseko that the sentence was not "fair" but that the family had had to accept it for their own "sanity".